We’re not built for this. (That’s ok, because I am). 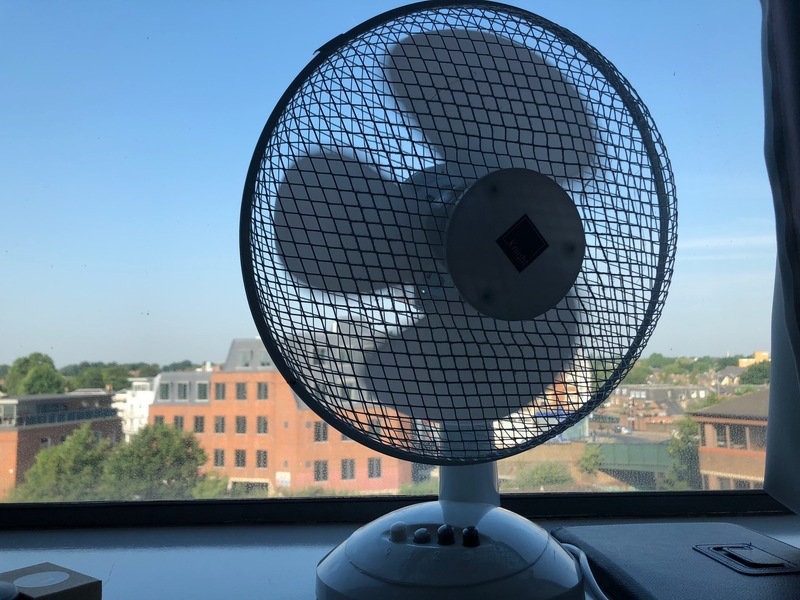 Looking out of my London hotel room this week, I’m greeted by beautiful sunshine, blue skies, and a fan sitting on the windowsill, working overtime – but providing very little relief. It’s a hot summer in the UK at the moment – and I love it. Coming from South Africa, the heat and sunshine is a welcome nod to outdoor living, al fresco lunches, chilled watermelon in the fridge and random, spontaneous walks on the beach. But (and there’s always a but), one thing is certain – many buildings in the UK are just not built for the heat. They’re built to keep us warm – because it’s usually chilly. And the amount of heat that most experience in the UK is minimal compared to the need for cosy, snug, insulated indoors. “We [our hotel, or us physically] are just not built for this heat”, says many, in an effort to excuse or cope in some way. And I realise that we are – we’re just not planning properly. Or at least, we don’t have the tools we need to be able to cope. Give us a rainy day – and we have an assortment of wellies, coats and umbrellas, anti-wet dog coats and special little water-absorbing mats that we magically pull out from nowhere. We’re geared for that. Because we’re used to that. So, how does business who is not used to something, overcome in times of challenge? Simple – they look at the tools they need. The beauty of us as freelancers means that we have years of experience on our side – and we’re accessible. I’ve worked with one client whose raison d’etre is to equip businesses with access to the best specialist consulting know-how. When organisations know they need help, but they have no idea how to access it – Talmix matches them to an independent consultant who has been vetted, has the experience, has the ability to step in, pick up and move on. As a freelancer myself, we bring something that many others simply don’t: A flexibility and versatility to work according to your timeline, budget and need. It doesn’t matter if you’re not “built for that”, because we are. Looking for help to become better? Let’s chat. Your job, as a brand, is to stop the scroll. 4 reasons why you need to show your customers who you really are. Death by # tag. Stop! Please. SOS!